Bad Boy lawn mower switches operate various functions of the mower. From Bad Boy ignition switches to power take-off switches, you can find whatever switch you need here! These switches come straight from the factory floor and will fit every Bad Boy Mower that has ever been produced! The guarantee of a perfect fit makes the installation of these lawn tractor switches easier and ultimately leads to more time in the field and less time in the shop! 30hp Kohler Oil Pressure switch. 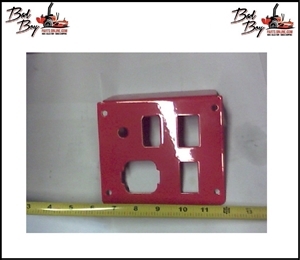 Bad Boy Part # 015-0037-00 or 015003700 Rocker Deck Lift Switch. Fits all Bad Boy mowers after 2009. Bad Boy Part # 078-3000-00 or 078-3000-00. Toggle switch deck lift. Fits Pup, Lightning and all Bad Boy mowers before 2009. Bad Boy Part # 078-8077-00 or 078807700. PTO Engager-Switch for Blades. Fits all Bad Boy mowers. Bad Boy Part# 056-8058-00 or 056805800. 12-Volt Auxiliary Plug. Bad Boy Part# 077-2075-00 or 077207500. Ignition Switch. Fits all Bad Boy mowers. Bad Boy Part # 077-8076-00 or 077807600. Momentary Start Switch Bad Boy Part# 077-6000-00 or 077600000. Magnet-Steering Arm-Stand ON. Bad Boy Part# 077-1000-00 or 077100000. Seat Switch Adaptor - Pup. Bad Boy Part# 036-5300-00 or 036530000. Safety Switch. Bad Boy Part# 077-8073-00 or 077807300.